Deborah's Journal: New hopscotch Fabric Line! a playful tone on tone super blender line of fabrics based on a collection of hand-drawn designs from Jamie Fingal's sketchbooks. dots, geometrics, flowers and loop-de-loops. hop, skip and jump over to the playground. 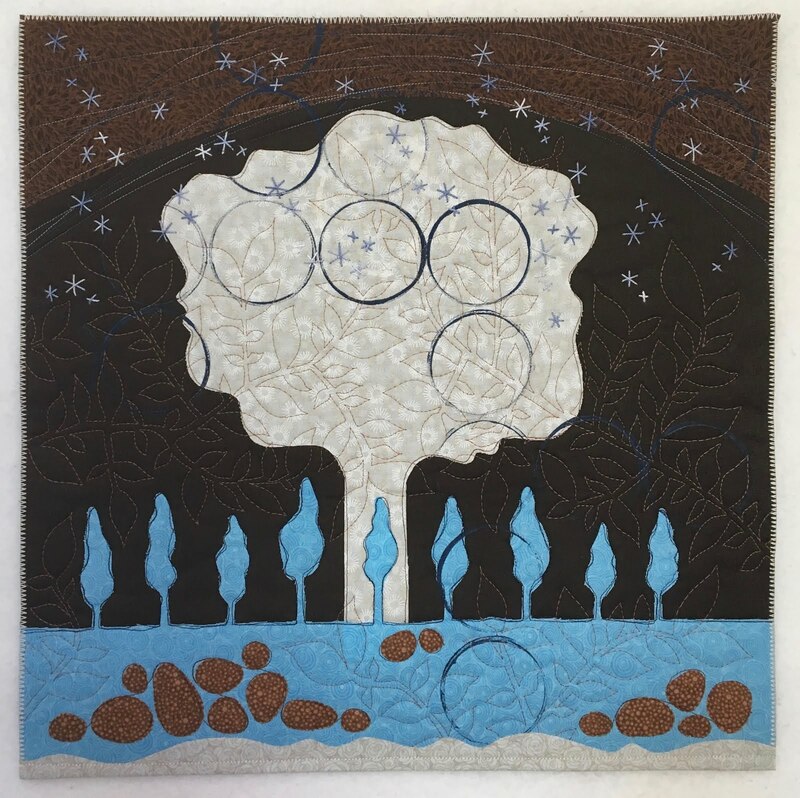 It's 18x18 and titled Moonlit Grove. I really wanted to work in a neutral color palette with just one pop of color. I was able to select several beautiful browns and creams and this serene-yet-strong blue. There are eleven different designs in tons of colors making a total of 83 different fabrics. 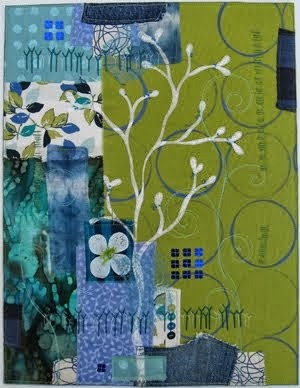 The line will debut at Spring Quilt Market in St. Louis in mid-May, and the fabric will ship to stores in August. Because the fabrics are so luscious and yet spare in design, I could really add my own spin to the design without being distracted by too much color or print. So of course I added paint, hand embroidery and free motion quilting. Several quilters made 18x18 squares for the fabric reps to take out in the field to show quilt shop owners what can be made with this line! Woot! 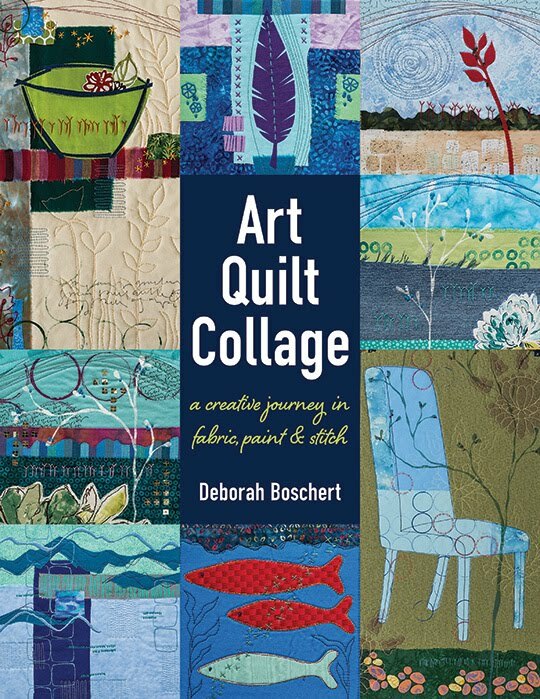 Follow along on the blog hop to see more quilts made with the hopscotch line. I love the elegant simplicity of this design. People rarely realize how difficult this is to achieve. I really love the sibrle way tou move color thru tour work witjout making it too busy. You always manage to keep the focus where you want it. As always, tour work is so truly inspiring. I look forward to your posts! I really love the subtle way you move color thru your work without making it too busy. You always manage to keep the focus where you want it. As always, tour work is so truly inspiring. I look forward to your posts! I like the way you portrayed moon glow with no moon in sight! !